The Trump administration is seeking to pay for recent expansion of Veterans Affairs to private health care through recently increased budgetary caps, according to an administration official. 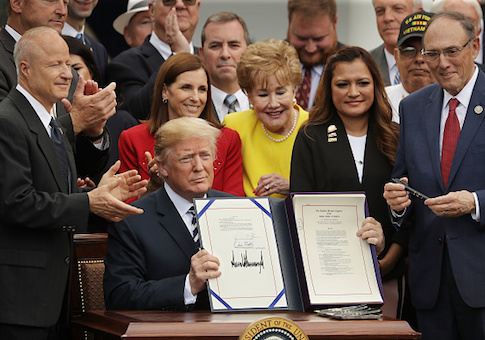 The VA Mission Act, signed into law by the president on Wednesday, creates a new program that allows veterans to seek private care. The law calls for billions for new programs to provide private care, but does not outline how they will be funded. The Washington Post reported the White House is working against funding the new law. However, the White House and the Republican congressional leadership both support securing funding for the VA expansion. "The committee will continue to work with the White House in finding the path forward to secure and fund the best care for our veterans," said David Popp, a spokesman for Senate majority leader Mitch McConnell (R., Ky.). "It's not a question of whether this important priority will get funded. It will be resolved during the upcoming appropriations process." An administration official told the Washington Free Beacon the White House is committed to funding health care for current and future heroes and said the expansion can be paid for under existing spending caps. Speaker of the House Paul Ryan's office confirmed Ryan (R., Wis.) agrees with the White House that the new veterans programs should be paid for with existing funds, rather than increasing spending. A proposal introduced by Sen. Richard Shelby (R., Ala.) and Patrick Leahy (D., Vt.) would create $50 billion in new spending to address the health care expansion. However, the administration says the creation of new funding is unnecessary and can be taken elsewhere from existing appropriations, after Congress recently approved a $67 billion increase in spending for nondefense programs in fiscal year 2019. The official added that the White House strongly supports creating a new, consolidated community care program for veterans' health care. President Trump's budget for FY 2019 funded the program under the nondefense discretionary cap, while providing $83.1 billion for the VA, an 11.7 percent increase from 2017. Of that, $73.1 billion would go toward health care services for veterans. The Community Care Program, which was created by the Mission Act, accounts for $14.2 billion of the president's VA budget.